Earle Sunday morning ride. I'm loaded down with a large thermos o'tea, camp chair and my buddy Betzi and her dog stuff. We're headed for the duck pond in Oak Park to sit with a cup of tea and watch the world go by. Empty roads on a Sunday morning. Ride on!! Duck pond...time to get busy doing nothing. My Expedition in the background. Plenty of parking. 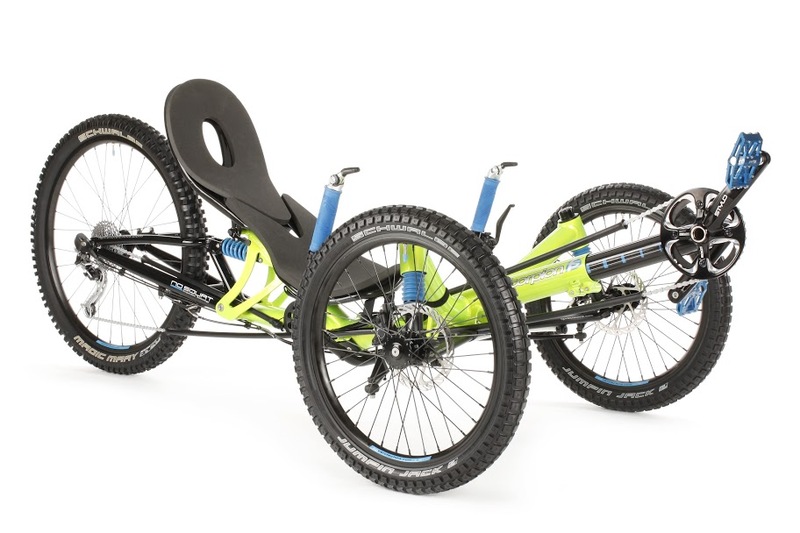 Let's get to the bottom line first...choosing a Catrike 700 or Catrike Expedition is a matter of personal choice. Both the 700 and the Expedition are solid trikes, built to handle tough riding and backed up by Catrike costumer service. The 700 and the Expedition are both stable at speed and share the same handling characteristics. The 700 is an awesome trike, it looks fast and is fast. It's a ride best suited for getting an adrenalin fix. The 700 should be kept light and geared for speed on the flats and downhill runs. Grinding up long roads with extreme grades takes some effort, but then there is the sweet downhill. Exceeding 40mph on a downhill is par for 700. The fun comes trying to find a road that is long, steep, reasonably straight and has good pavement so the 700 can show it's stuff going over 50mph. I do suggest when exceeding 50mph that you are acquainted with the road so there are no surprises and wear a helmet! On the flats I generally pass more DF (diamond frame) riders then pass me. In recent memory I don't recall ever being passed on a downhill. Even the young, fit and properly attired lads with advertising plastered over their lyra bodies fade away in my rear view mirror. Riding a 700 is a prescription for an old fart like me to feel the thrill of an endorphin induced high. That endorphin high comes at a price. The 700, when set up for speed, is a hard ride that given the conditions of some our streets it can shake your fillings out. On long rides the seat being laid back at 25 degrees may be uncomfortable for some folks on long rides. I don't consider it a touring trike. The 23C tires (if you want speed) are going to get flats. The skinny 23C's trade puncture protection for performance. Of course some of these setbacks can be mitigated with different tire selection and putting a rack on (which I did at one time) to carry more stuff. Ahh my faithful and trusted ride. The Expedition is a versatile ride. It can be setup to ride fast or loaded down to tour the world in comfort laid back in it's 37 degree reclined seat. Keeping the the Expedition light and adding high performance tires would bring the Expedition close to matching the the performance of the 700. I prefer to ride in comfort when not screaming down a hill on the 700. I've loaded my Expedition up with Marathon Plus tires all around, heavy duty rack, rack bag and panniers, extra tools and other goodies that give me confidence that I can survive the apocalypse with nothing but my Catrike Expedition. Another benefit, for me personally, I'm inclined to enjoy the world around me more as I meander with Betzi in tow and on a solo ride. The 700 makes me feel like I have to ride hard and fast whereas the Expedition is telling me to take it easy and smell the roses. Trike, body and mind are about 20% slower when riding the Expedition compared to the 700. Also the Expedition is geared for climbing and not speed. But even on this beast I still pass my share of DFers and that's a fun blog post for another time. That's right these shorts have a vent to let the air out so your shorts don't blowup and turn into air brakes. Actually the vent is meant to keep you cool but it's unintended benefit suits us bent riders. Next best thing to squeezing into lycra cycling shorts to avoid having your pants blowup. 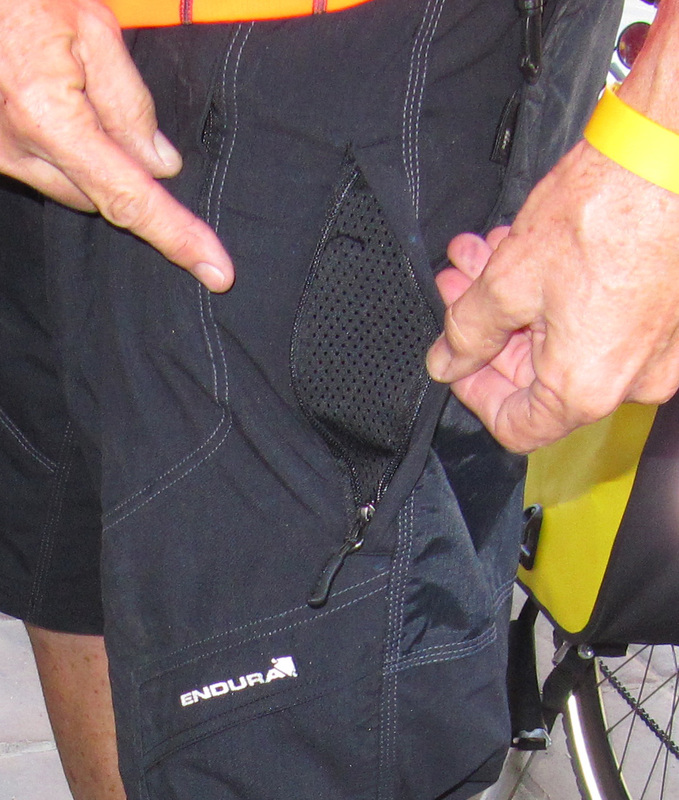 I just bought a pair of the original Endura Hummvee shorts. Back in June I bought the Endura Hummvee Lite Shorts and I'm very happy with them but the summer mornings are unseasonably cool so I bought the heavy duty Endura Hummvee. 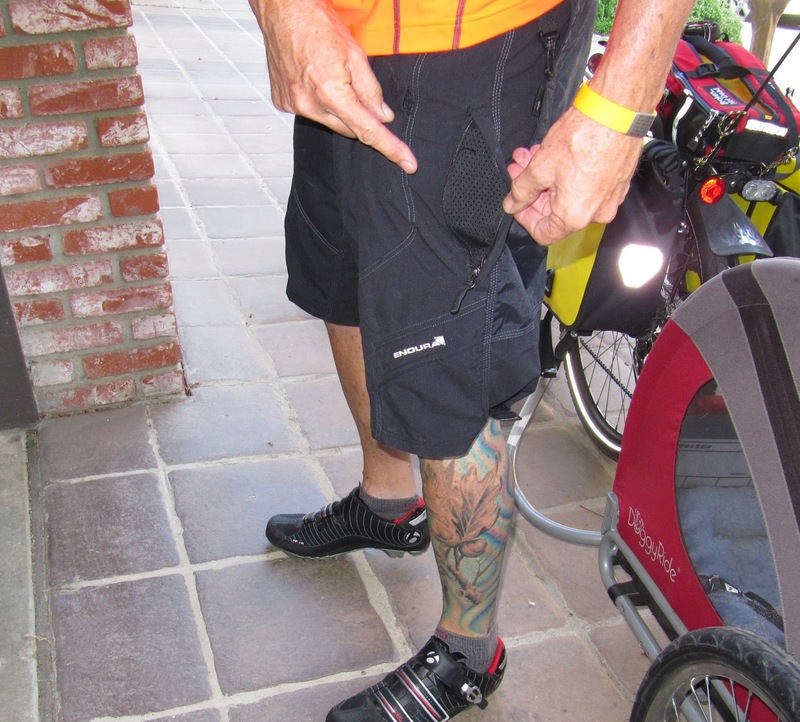 Like the Lite Endura they have velcro leg hems and all the other good stuff, but in addition they have an air vent. It keeps your legs cool and lets the air out of your shorts so they don't blow up like a balloon. Personally tested up to 44 mph with minimal ballooning. Nice threads! Sometimes all ya need is a little time off the road to re-boot your brain. In this case a 1/2 mile local MUP that I occasionally escape to and then back to the sights and sounds of the morning traffic. Keeping it simple with a new wired Cateye Enduro computer. No more crazy max speed readings. For GPS and tracking I still use my iPhone with a Motion X app. Tracks are uploaded from Ride With GPS. Mounted on my Catrike 700. The Cateye Enduro comes with a sturdy wiring harness which includes a spiral plastic protection sheath. Mounted on my Catrike Expedition. Just below the handle bar is the spiral sheath protecting the wire. My Cateye wireless computer maximum speed reading has been giving me unrealistically high readings on many of my rides. Time to get wired? "Why is my maximum speed unrealistically high? The unusual maximum speed readout that you are incurring is due to the cordless computer unit registering interference from an outside electrical field. Sources of such fields include RR crossings, power lines, security systems, radio towers, home computers, televisions, radios, cell phones, garage door openers, high intensity discharge lighting systems, etc. When all speed related functions are accurate except maximum speed, this is almost certainly the case, as cordless/wireless models manifest such reception of outside interference as an abnormal max speed readout as described. Unfortunately, there is no solution for this, as the FCC requires electronic devices such as bike computers to accept all such outside interference." With a little trial and error I noticed that the max speed would have an erroneous reading at certain intersections after riding over the signal sensors. My receiver on my recumbent trikes are mounted about 18" off the ground on my handlebar bringing it well within range of the street embedded sensors. I'm guessing that is where the problem lies. I know that there are different types of sensors used to monitor intersections but I'm not going to spent anymore time figuring it out...now I'm wired and no problems. Being enticed by the HPV Scorpion FS 26 was bad enough...now I need to come up with good reasons why I don't need the HPV Scorpion FS Enduro before my family thinks I'm crazy. Not easy.